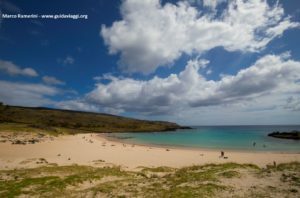 I spent almost a week at Easter Island. The island is one of the most remote places in the world. Take a geographical map and observe its location you will see that the nearest inhabited lands are thousands of kilometers away. The nearest inhabited area, which is almost 2,000 km away, is the equally remote island of Pitcairn, home to fifty people descended from the Bounty mutineers. The coast of South America is about 3,500 km and the island of Tahiti is more than 4,000 km away. 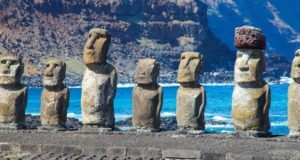 To reach Easter Island there are two options: a daily flight from Santiago de Chile and a weekly flight from Tahiti in French Polynesia made by the LATAM airline. Both flights have a duration of 5/6 hours. 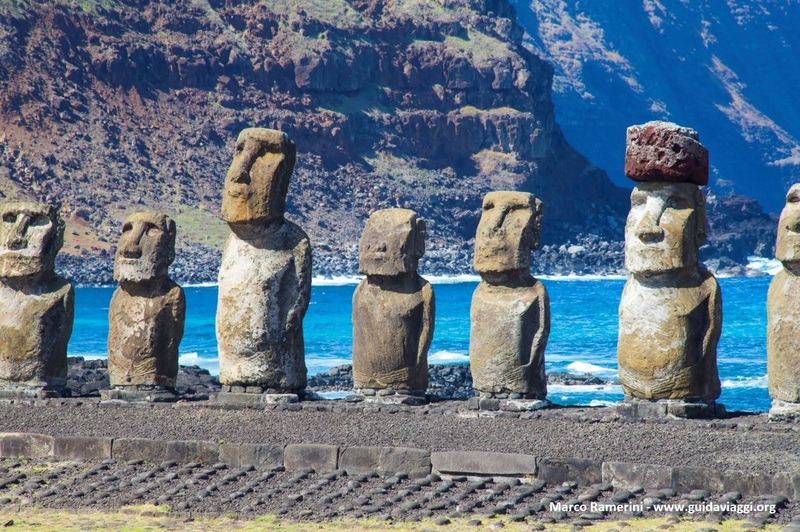 Buy air tickets from Santiago de Chile to Easter Island very early, they can cost between 300 US$ and over 1200 US$. 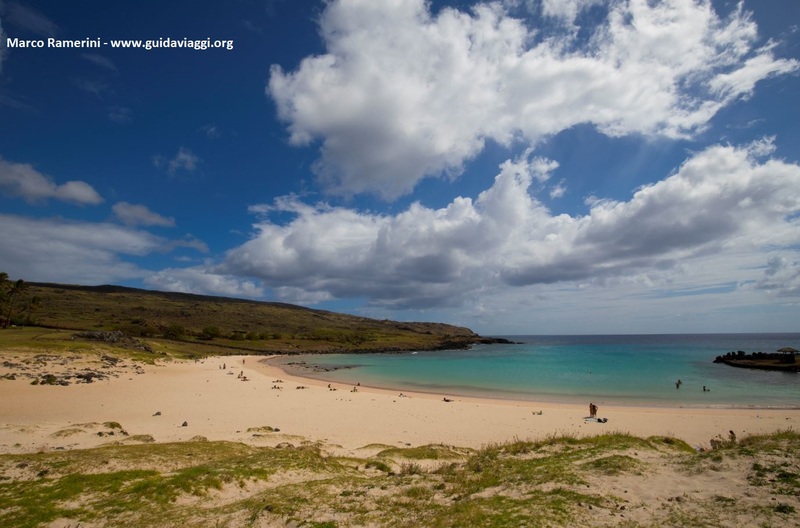 You will arrive at Mataveri Airport and here you will find an office where you will have to buy a ticket for Rapa Nui National Park. The ticket is necessary to visit the island, which is largely, fortunately, a well-kept national park. 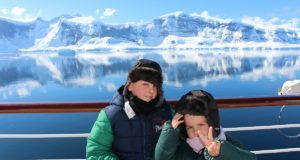 The cost for non-Chileans is 80 US dollars per person, the validity of the ticket is 10 days from the visit of the first archaeological site. The park ticket allows you to visit every archaeological site of the island as often as you wish. Only the two most important sites: the archaeological site of Orongo and the moai quarry of Rano Raraku can only be visited once. So take your time when you visit these two places because you can not go back unless you buy a new ticket. Always remember to bring the park ticket with you because at every entrance to an archaeological site you will be asked of it and it will be stamped. Each archaeological site has its own stamp, I besides the ticket I made the stamps also on a page of the travel diary, a nice memory of the places visited. The airport is located next to the only town on the island: the village of Hanga Roa. 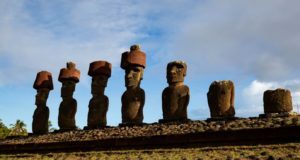 About 7,000 people live on Easter Island, partly descended from the ancient Polynesian inhabitants: the Rapa Nui people. The island, which has a triangular shape, covers about 160 sq km of surface. At the three corners of the island are the three main volcanoes: the Terevaka, which with 507 meters of altitude is the highest on the island, the Poike (370 meters) and the Rano Kau (324 meters). A dozen smaller volcanic cones punctuate the interior of the island. The landscape of Easter Island is barren, the land is largely covered with shrubs and low vegetation. The island is famous for the stone statues, the moais. The ancient inhabitants of Easter Island have built hundreds of these huge statues that measure a few meters in height – the average height of these statues is 4 meters, but the highest ever erected reaches 10 meters. 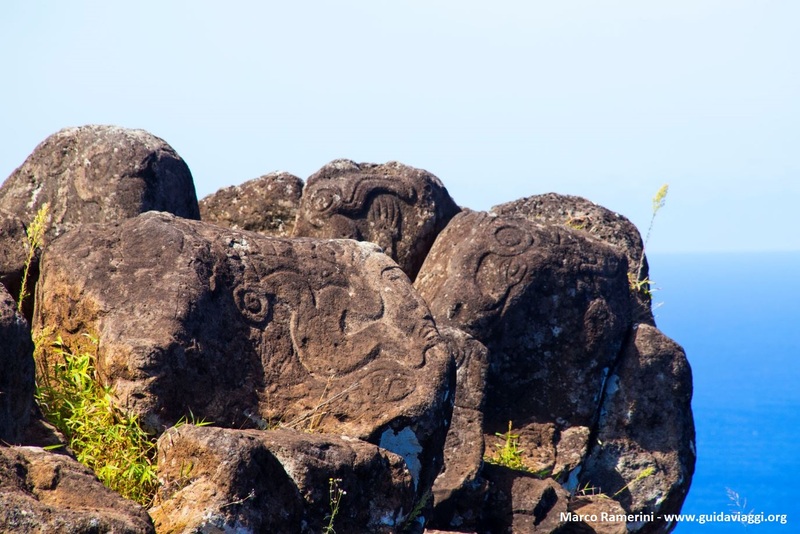 Almost all the statues have been carved in the stone carved from the quarry of the Rano Raraku volcano. In this place there are hundreds of moais still to be finished, one of these unfinished moai measures even 21 meters in height. The island is rich in archaeological sites, practically in almost every pile of rock that you will find along the coasts of the island, if you look closely, you will be able to see remains of the ancient civilization that shaped the moais. How many days to stay on the island? Considering where it is and the time to get to it is good to stay one night more than less. Most tourists stay 3 nights and then leave again. In my opinion 3 nights is too short a period. For lovers of history and archeology, a visit to this island is exciting. My 5 nights spent on the island have passed in the blink of an eye, with hindsight I would have preferred to stay one more night. However 4 or 5 nights can be enough to visit most of the archaeological sites and to get in tune with the island. The island at first sight is bare and barren, but it bewitches you. I could not stop stopping at every archaeological site, every pile of stones, every cliff, every volcano. In the village of Hanga Roa stop at the Post Office to put a stamp of Easter Island on your passport or in your diary. Try to spend at least a Sunday morning on the island so as to attend the 9:00 am mass in the local Catholic church where you can listen to the magnificent songs in Rapa Nui, the Polynesian language of the inhabitants, which is very similar to the Tahitian. 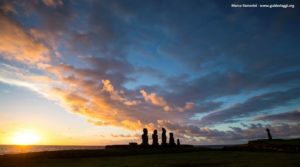 Go to watch the sunset on the sea in front of the group of moais of Hanga Roa where there are the moais platforms of Ahu Tahai, the solitary Ahu Ko Te Riku and the farthest Hanga Kioe. Do not miss a visit to the interesting Antropológico Padre Sebastián Englert museum where you will have the opportunity to deepen the history of the island and where you can admire the only authentic eye of a moai. 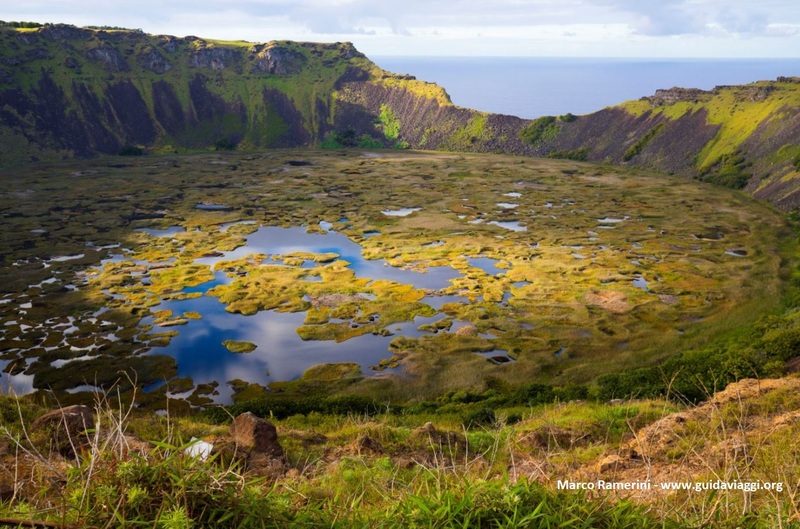 Among the most spectacular things to see on this remote island I really liked the crater of the Rano Kau volcano. Here is absolutely to follow the path that runs along the edge of the crater to the point where it meets the sea and where the cliffs do not allow to continue beyond. Even the ceremonial village of Orongo has its charm. Another fascinating place is undoubtedly the cave of the moais of the Rano Raraku volcano here is to see the inside of the crater of the volcano where there is a lake and several moais and then the outer slopes of the volcano literally dotted with statues that look like mushrooms that are born from the volcanic land of the island. 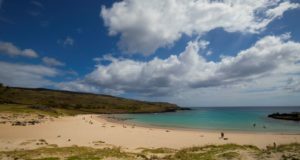 The white sand beach of Anakena, also dotted with groups of moai and full of palm trees, is the only place on the island that recalls a tropical island. Another mystical place is the Ahu Tongariki, the most spectacular moai platform, where there are 15 moais, including the heaviest ever erected moai that weighs 86 tons. 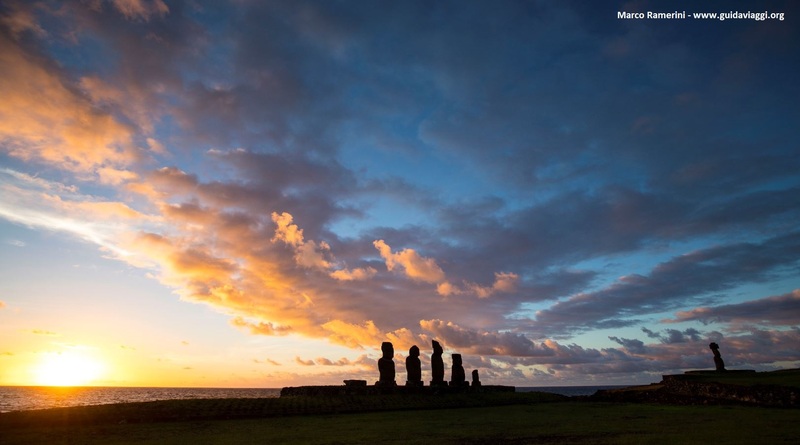 From the Ahu Tongariki you can admire beautiful sunrises with the sun born just behind the moais. 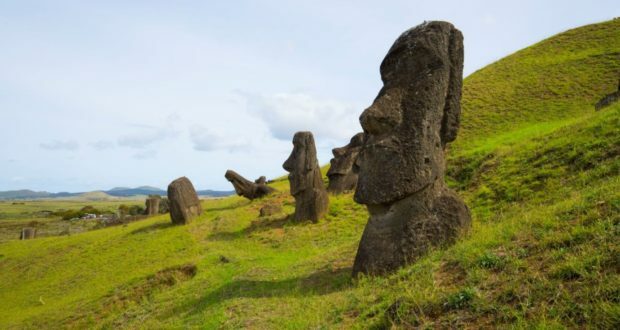 Among the many things to see also the quarry of the moais of Puna Pau and the only moai platform facing the sea, that of Ahu Akivi, located in the interior of the island not far from Hanga Roa. I also really enjoyed a trek that I did in the wildest part of the island, along the slopes of the Poike volcano at the eastern end of the island. Even the highest peak on the island the Terevaka volcano is easily reached by a walk of a few hours.